New research reveals major global corporations are still ignoring regulations put in place to protect consumers from misleading marketing claims. CHICAGO (March 4, 2015) – New research, commissioned by the international non-profit organization Two Sides, has revealed that major global corporations are still using inaccurate and misleading environmental claims to encourage consumers to ‘go paperless’ and switch from paper-based to digital communication. This is despite legislation being introduced by advertising standards authorities to protect the consumer from being misled. The survey, undertaken in February 2015, showed that in the UK, there is still a significant proportion of banks, utilities and telecoms making false environmental claims. Research in the US shows a similar picture with half of the leading Fortune 500 companies in the same sectors doing the same. “This is extremely frustrating and unacceptable,” says Martyn Eustace, Founder of the Two Sides initiative. 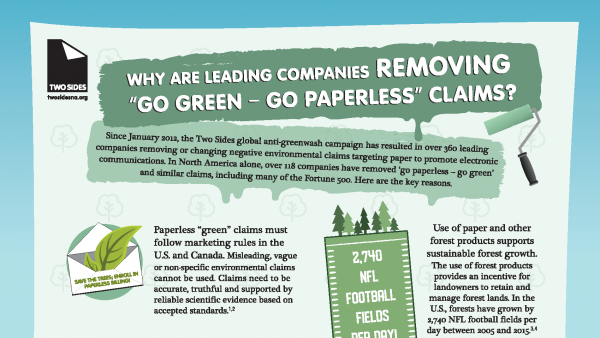 “The fact that marketers in some of the most high profile corporations in the world are still using unsubstantiated and misleading environmental claims to persuade consumers to switch from paper-based to cheaper electronic communication is outrageous. Many consumers want a paper option but they are being manipulated by a lack of clear and accurate information. 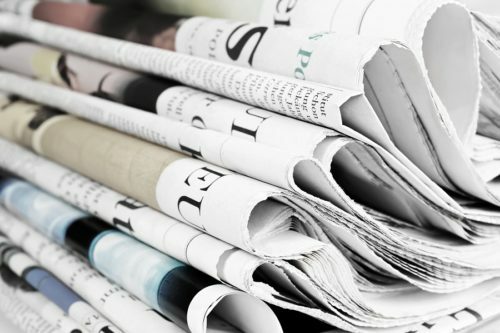 Paper is based on a natural, highly renewable and recyclable resource and can be a sustainable way to communicate, especially when compared to electronic media." Two Sides will be engaging with companies in Europe, the USA, Canada, South America, South Africa and Australia, who have either reneged on undertakings to stop using misleading environmental claims or are now again claiming that switching to online billing and communication is better for the environment without supplying verifiable supporting evidence. 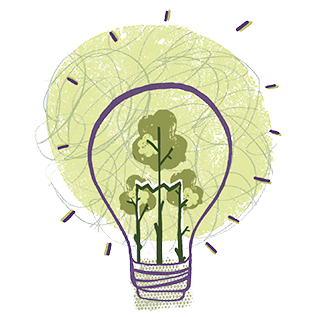 Original UK research completed in 2012 revealed that 70% of telecoms businesses, 43% of the major banks and 30% of utility companies were all making inaccurate claims about the environmental benefits of switching from paper to digital communication. However, when challenged by Two Sides, 82% of these companies changed their marketing messages. In North America, Two Sides has been successful in converting 30 of the Fortune 500 companies in the same sectors and is in discussion with a further 25 organizations who have yet to comply. Two Sides maintains that the linkage made between switching from paper to electronic services and helping the environment not only creates a misleading impression about the sustainability of print and paper but, as these claims are also unsupported by facts, they contravene the latest UK CAP code, (Committee for Advertising Practice), guidelines by the US Federal Trade Commission and CSR Europe (the leading European business network for corporate social responsibility), and the UK Government department DEFRA. 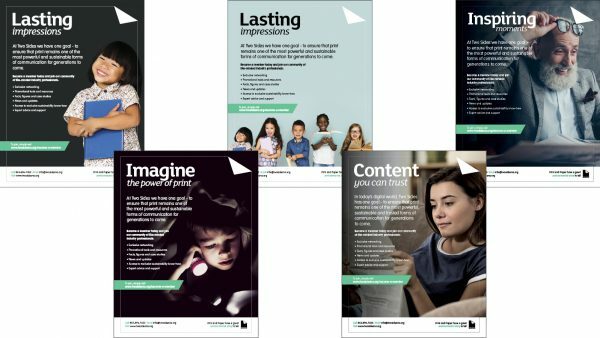 Eustace emphasizes that, “we are more than willing to engage in a meeting and provide these companies’ marketing departments with all the facts about the sustainability of print media to help ensure that the messages they are sending out to the public and their customers are both factually and environmentally correct. Reporting to authorities is a move of last resort. In fact, we seldom have to do this and find that, working together with corporations is the best way to ensure that consumers remain protected from the increasing greenwash in our society. 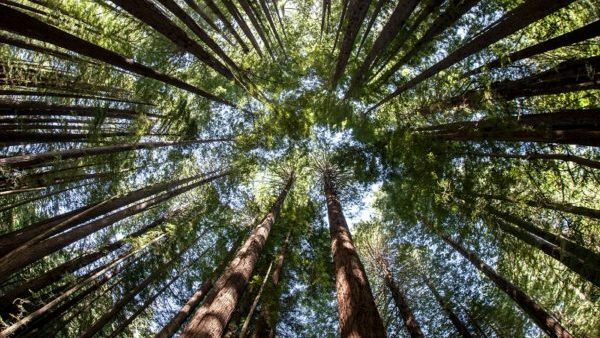 “In the US, the latest statistics from the US Department of Agriculture show that net forest land area has increased by 3% in the past 60 years, and wood volume on timberland (number of trees) has increased 58% during the same time period,” adds Riebel. Two Sides is an independent, non-profit organization created to promote the responsible production, use and sustainability of print and paper. Two Sides is active globally in North America, Europe, Australia, South Africa, Brazil and Colombia. Our members span the entire print and paper value chain, including forestry, pulp, paper, inks and chemicals, pre-press, press, finishing, publishing, printing, envelopes and postal operators. For more information about Two Sides North America, please contact us at 1-855-896-7433 or [email protected]. Visit the Two Sides website at www.twosidesna.org and follow Two Sides on Facebook, LinkedIn, Twitter and YouTube.